The company was founded in 1987 as McAfee Associates, named for its founder John McAfee and is now the largest developer of software and technology for network security and secure access. Cloud services and software that help block McAfee Internet intrusion and implement protection of computer systems from online threats and virus attacks. McAfee products are focused on individual and corporate users. Vendor solutions can operate as a stand-alone or integrated into a unified system of protection against malware, spyware, adware, viruses, and phishing tools with security management. McAfee customers receive professional level data collection and analysis, risk mitigation, regulatory compliance, and high operating efficiency. Intelligent forecasting based McAfee Global Threat Intelligence enables businesses and consumers to proactively respond to new and unknown threats thanks to access to information collected by the sensors 100 million Internet threats. 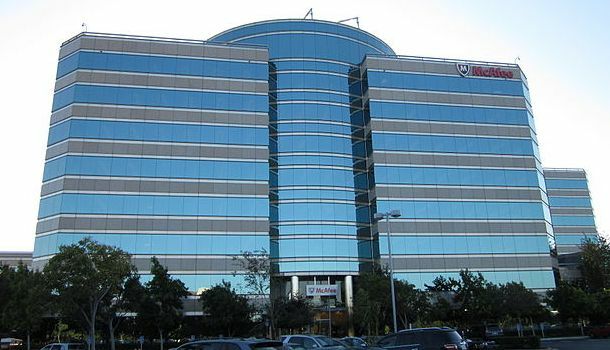 McAfee headquarters in Santa Clara, California. Protect your critical data and compliance with privacy – McAfee Total Protection for Data, McAfee Endpoint Encryption and McAfee Total Protection for Data Loss Prevention. Database protection against internal and external threats in order to prevent data loss – McAfee Database Activity Monitoring, McAfee Database User Identifier, McAfee Integrity Monitoring for Databases, McAfee Virtual Patching for Databases, etc. Protection of the Internet and e-mail – McAfee Content Security Suite, McAfee SaaS Web & Email Security with Archiving, McAfee Email Protection, McAfee Security for Email Servers, etc. Endpoint Security – McAfee Total Protection for Endpoint, McAfee Endpoint Protection, etc. Network security – McAfee Network Security Manager, McAfee Network Security Platform, McAfee Network Threat Response, etc. Risk protection and ensuring compliance – McAfee Application Control, McAfee Configuration Control, McAfee Policy Auditor, McAfee Risk Advisor, etc. Cloud protection – McAfee SaaS Email Encryption, McAfee SaaS Endpoint Protection, McAfee SaaS Web Protection, etc. Managing enterprise information protection – McAfee ePolicy Orchestrator.